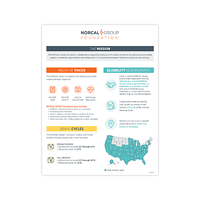 What types of programs does NORCAL Group Foundation fund? The Foundation provides grants to eligible organizations to fund programs related to Patient Care, Patient Safety and/or Physician Wellness. Organizations seeking funding must qualify as exempt under Section 501(c)(3) of the Internal Revenue Code. Are there any exclusions to funding? Individuals seeking personal assistance or scholarships. Projects seeking to promote religious or political objectives. Construction, building enhancements or refurbishment. General operating costs, staffing, equipment or capital campaigns. How long is the application cycle open? Spring Grant Applications will be open from March 1st through April 15th. Fall Grant Applications will be open from September 1st through October 15th. Applications are available at norcalgroupfoundation.org/apply during the dates listed above. Late submissions will not be considered at this time. Can I preview an application before applying online? Yes. An application planner is available here. Yes, however you must submit individual requests for each program/project. What amount should my organization request? We ask that applicants consider and explain all costs and measurable outcomes associated with their program when applying for funding. Average grant awards range from $5,000-$30,000. Will all grant requests be funded? No, we receive a high volume of applications from many worthy organizations each grant cycle and are unable to fund all requests. What helps makes an application successful? Demonstrated alignment with NORCAL Group Foundation’s mission and focus areas. Exhibiting defined goals and objectives, including expected milestones and outcomes. Answering all questions completely in addition to providing requested documentation. Will NORCAL Group Foundation award partial grants? Can I save an online application to submit at a later time? Yes. During an open grant cycle, the online application allows users to save their answers and resume at a later time. Please note that required attachments, located on the final page, will not be saved between sessions. When will my organization be notified if a grant is awarded? Spring grant awards will be announced on or before June 15th. Fall grant awards will be announced on or before December 15th. Will my organization be notified if our program/initiative is not selected? Yes, all applicants will be notified of selection status. Who can I contact with additional questions about the information above? Please email additional questions to grants@norcalgroupfoundation.org or Ashleigh Allen, 512.879.5130.